After finally reading « The long tail » by Chris Anderson, I decided to share with you his wonderful explanations about how the market is changing, and how it means that the first positions on the online market will not belong to the big companies and every small business will have the opportunity to reach the same visibility. It is a few years old idea, but I think it’s worth it to get to know to understand how the market has developped and how we should give importance to it. The basic concept is that Internet is transforming the market, from a mass market without competence into a world of infinite small market segments or niches. If we check the graphic, we can see the hits and biggest brands are on the peak, at the beginning of line, but then it is followed by a very long tail where all the small businesses are located, and it represents the 70% so it is much bigger. The long tail is made of many mini tails, each of which is its own little world, Chris Anderson says. He explains the 3 driving forces of the long tail effect. 1- Tools of production: Hardware and software have put creation into the hands of everyone, the result is an exponential explosion in niche products. Not all of them are great, but an explosion in the number of products are available. 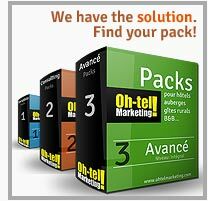 Everyone can create and sell a product or a service. We can see every day more and more small businesses making their own place in the market: clothes, cupcakes, rural houses… or selling services like translations, music, etc. 2- Internet aggreagators: Aggregators pull tens of millions of niche products together, all in one spot. You can advert your small business in a wide range of Internet places, depending on your industry and on who you want to see/buy your products. 3- Filtering software connecting supply and demand: This is a very important thing, it’s the way Internet links you to the potential clients. Filters, anything from Google Search to “those who bought this also bought that” recommendations, empower customers and sells. From music to hotels. i.e. When you Google search about holidays in Dakar, you will find many adverts related to that, hotels, restaurants, etc. And in this way starts the creation of new small tails that are linking the consumers to many small places of their interest. Creating a long tail effect. And you know what? 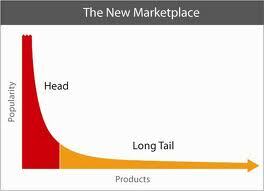 Every single business has its own long tail.